I honestly live for a good pamper evening. In an age where we're constantly scrolling through various social media feeds and not always getting enough sleep, it's really important to ensure that you set aside some 'me time' to relax and recharge. Taking care of yourself, in my experience, also feels that little bit nicer when you've got some gorgeous products to hand but they can definitely add up to a substantial amount, and who wants to add 'did I spend more on beauty products than food this month?' worries to your list of concerns? With that in mind, here's how to have the perfect pamper evening without spending much more than a tenner. Let's begin! 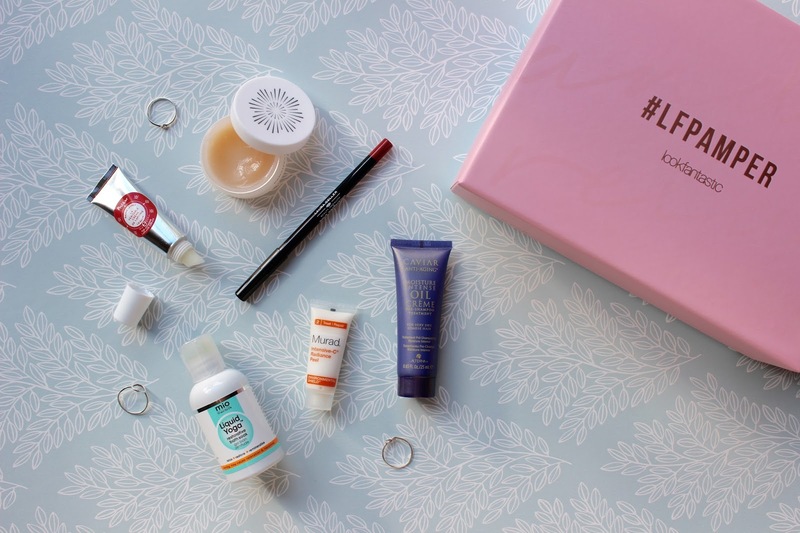 Introducing the October edition of the Look Fantastic Beauty Box, this month's theme is #LFPamper. Inside the box (which might I add is my favourite packaging they've ever done - all that soft blush pink and rose gold embossing makes me swoon) is a carefully selected handful of products all chosen to relax, treat and see you through the changing seasons. First things first grab your beverage of choice - I like peppermint or camomile tea when it comes to the evening but whatever floats your boat, bring it upstairs and pop it on the edge of the bath along with the free copy of ELLE you get in your beauty box whilst you turn the taps on. Whilst they're running, pour a little Mio Liquid Yoga Restorative Bath Soak (£26) into the stream of water and take a second to inhale the scent. This has been one of my favourites for such a long time as it's an incredibly relaxing mix of epsom salts, lavender, arnica and mandarin that instantly tells my brain 'okay hon, it's time to take it easy'. If you suffer from any aches or pains the mineral rich ingredients help to soothe and calm, and there's a Mio Liquid Yoga Candle if you fancy getting all matchy-matchy! Is a pamper night complete with a face mask? Nope, so unscrew the jar of Oskia Renaissance Nutri-Active Brightening & Resurfacing Mask (£49.50) and massage into clean, dry skin until it turns white. Containing AHAs to gently exfoliate and brighten, it gives a glow to the skin whilst helping to protect and soften. As we're really pulling out all the stops here to truly pamper ourselves, apply the Murad Intensive-C Radiance Peel to your chest and décolletage - the formula is packed with glycolic acid, Vitamin C and Indian fig to unclog pores, which will work wonders if you ever get congested around this area. Step into your gorgeously scented bath - you can also add the LUSH Bubble Bar in 'A French Kiss' at the same time as the Liquid Yoga if you'd like to amp up those lavender levels - and allow yourself to relax. If, like me, you like washing your hair in the evening then the next step is to treat your hair to the Alterna Caviar Moisture Intense Oil Crème Pre-Shampoo Treatment which you apply before washing, and what better time to massage it through than when you're in the bath? If replenishes dehydrated hair with a well-needed boost of moisture and my hair looks so sleek and shiny after using this, so work it from root to tip then have a flick through your magazine whilst you lay back and let your beauty products do all of the hard work for you. After twenty minutes, step out - preferably into a super fluffy dressing gown like this cosy Topshop number - and gently remove both your face mask and your chest mask with a muslin cloth soaked in warm water. Pat dry with a towel, spritz with a mist of La-Roche Posay Serozinc Toner, press a few drops of the Caudalie Polyphenols C15 Overnight Detox Oil into your skin and finish with the NUXE Creme Prodigieuse Night Cream. Now it's time to rinse out your pre-shampoo treatment, wash, condition and braid it. You've probably been wanting to get into your pyjamas all day and it's finally time, so pop those on - these are my current favourites! - and jump into bed with a hot water bottle. One of the best things about a pamper night is chilling out and watching a movie, so find a funny feel-good film (Just Go With It, Mean Girls, Stepbrothers - you know the drill!) and get cosy. Putting the Laura Geller Pout Perfection Waterproof Lip Liner in your makeup bag for a night that involves dancing and cocktails rather than Netflix and hot chocolate, instead plump for the Polaar Genuine Lapland Cream Lip Balm and then snuggle down. And hey presto, there we have it - the perfect pamper evening without breaking the bank!